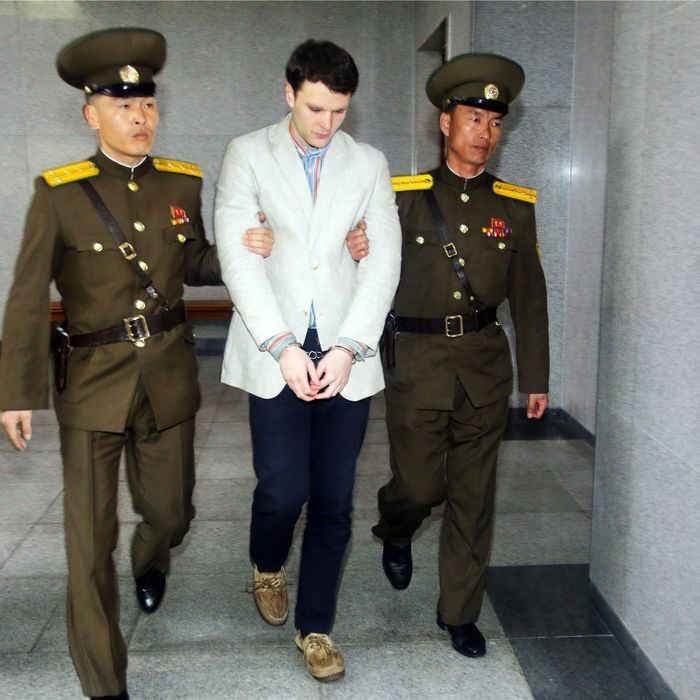 Otto Warmbier arrives at court for his trial in Pyongyang on March 16, 2015. Following the death of University of Virginia student Otto Warmbier on Monday, shortly after he was released from a North Korean prison, President Trump said in a statement that his passing “deepens my administration’s determination to prevent such tragedies from befalling innocent people at the hands of regimes that do not respect the rule of law or basic human decency.” Obviously Warmbier’s death increased tensions between the two nations, but it’s unclear what Trump might do to retaliate against Kim Jong-un’s regime. Warmbier’s family said they learned last week that the 22-year-old had been in a coma since March 2016. The North Koreans claim that he fell into a coma after contracting botulism and taking a sleeping pill, but U.S. doctors say it appeared the oxygen supply to his brain was cut off. Though doctors could not say what exactly drove Warmbier into a state of “unresponsive wakefulness,” several lawmakers said he was “murdered” by the North Koreans. Most of the lawmakers who expressed their sadness and outrage over Warmbier’s death weren’t specific about how exactly the U.S. should respond. One option is for Congress or the Trump administration to place new restrictions on Americans traveling to North Korea. Last month Representatives Adam Schiff and Joe Wilson introduced the North Korea Travel Control Act, which would require licenses for American citizens to travel to the country. Americans would be barred from visiting as tourists. On Monday, Tillerson said that the U.S. holds “North Korea accountable for Otto Warmbier’s unjust imprisonment,” and demands the release of the three other Americans still being held by Pyongyang. However, he did not mention a travel ban. Warmbier’s death may also put more pressure on the U.S. to urge China to rein in its neighbor, though the situation had already escalated in recent months due to new North Korean missile tests. Trump declared China must “solve North Korea” or “we will,” but so far it’s unclear what that means, and how his policy differs from that of previous administrations. Last week Tillerson said the U.S. is “moving into this next effort of are we going to have to …. start taking secondary sanctions,” but so far the Trump administration has held off on placing sanctions on Chinese companies that do business with North Korea. Bruce Klingner, a senior research fellow at the Heritage Foundation’s Asian Studies Center, told CNN that the Trump administration isn’t imposing secondary sanctions due to the “naïve belief that President Xi will do more than China has in the past,” but it’s time to stop holding back on China. “If ever there was a wake up to call to greater action, it’s Otto’s death,” Klingner said.